How To Pray And Get Results: Removing the Barriers Blocking Your Prayer Life is a non-fiction book on Christian living by author Sheldon D. Newton. In this short but comprehensive guide, Newton looks at the obstacles in daily life which can hinder effective worship and therefore interfere with the true spirit of prayer. Scripture references highlight the importance of the Word of God and its proper place within your prayers, teaching you to apply those most important passages to your life and to recognise God’s help when it is given to you. The book is divided into helpful sections regarding different types of prayer requests for easy reference. What impresses me most about Sheldon D. Newton’s style of writing is the atmosphere of humanity surrounding it rather than theology or even religiosity. How To Pray And Get Results: Removing the Barriers Blocking Your Prayer Life deals with real life situations that everyday people face, and the ways in which they try to access prayer through desperation, need or hope, but often feel as though their wishes go unanswered. Newton skilfully references extremely relevant sections of scripture to help those in need to reframe their thoughts and prayers effectively, not only so that they know what to ask God for, but also so that they can appreciate the help that’s delivered in return. Overall, this short read was very uplifting, accessible, and not at all condescending or preachy to its reader. This is an accomplished and well written viewpoint on modern Christian living. How To Pray And Get Results: Removing the Barriers Blocking Your Prayer Life by Sheldon D. Newton is a non-fiction guide on how to pray the way God intended. This how-to book will appeal to Christians and people interested in prayer, religion, and the Bible. There are many passages of scripture directly from the Bible used to support the text. Those familiar with the Bible will appreciate the references to the scriptures and how these relate back to the suggestions made to increase prayer results. I was raised in the church so I am familiar with prayer and Christianity. However, I was hoping this was a more secular book that would relate to anyone that wanted to learn how to better pray. This book is aimed mainly at Christians and those that are super-religious and take their Christianity seriously. If you are religious and want a read a book that reaffirms how you should believe, this is the book for you. There are many good scripture examples to support the teachings made by Sheldon D. Newton. However, if you consider yourself more "spiritual" than religious, How To Pray And Get Results: Removing the Barriers Blocking Your Prayer Life is probably not the book you are looking for. Unfortunately, there isn't room for other religions in this book, which is predominantly geared toward Christians and the teachings of the Bible. On an interesting note, I found Chapter Seven's teachings very similar to the law of attraction taught by books like The Secret. I don't know if this was the author's intention, but it made the book more credible to me because it is teaching many of the same principles that other secular books are also teaching. The idea of praying is not new. Praying to a higher power is a fundamental part of Christianity and indeed most other religions on the planet. In How To Pray And Get Results: Removing the Barriers Blocking Your Prayer Life, Sheldon D. Newton explores what prevents the devout from getting the answers they need through prayer, and allows readers to understand better ways to pray and to use prayer throughout their daily lives to live better. One thing I wasn't really expecting was the chapters regarding the laws of effective praying which I had previously never considered. If I pray, it tends to be of two varieties: rhythmic and rote memorized prayer as in a church setting or around the dinner table when we say the traditional meal prayer. There were a lot of different ways of praying mentioned in this book and they were quite new to me. Sheldon D. Newton is concise and descriptive with his imagery, using passages of scripture and Bible verses (King James version) to great effect. I felt like I learned a thing or two about the different ways of praying, and I've been a card-carrying Catholic since my elementary school days. An interesting and informative read for all those of the Christian faith. 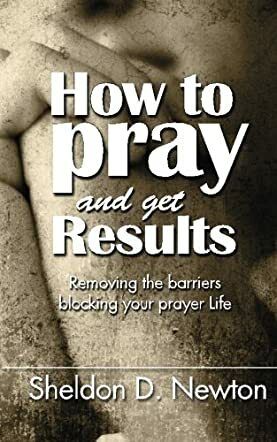 How To Pray And Get Results: Removing the Barriers Blocking Your Prayer Life gets my vote for "Best Christian Book Club Read" and would be at home in any Christian bookshop or religious center. This book could greatly benefit the Christian reader.